Sometimes the term "retrospective" can be used as a finalizing period for a band and sometimes it can be used as a continuing comma. Sometimes it can also start off as one and then gracefully turn into the other. Such is the case with MxPx and their incredible new DVD, Both Ends Burning. It's described by the band as "a film that captures MxPx at a crossroads in their seasoned career" and a "documentary (that) not only follows the band's struggles in the face of the new touring climate, it also looks at the legacy and impact that Mike, Tom, and Yuri have had on the music industry, fellow bands, and their fans." While that may sound like a daunting task, it certainly captures the overall mood of Both Ends Burning perfectly. Part reminiscing, part forecasting and part detailing of what's currently going on smack dab in between the two, Both Ends Burning is a great snapshot of MxPx's stamp on the musical landscape and their continuing pursuits to make good music, have fun and most of all, remain wholly and completely MxPx. Both Ends Burning starts off back in 2010 with drummer Yuri Riley's decision to quit the band and their subsequent monumental Las Vegas show where they played Life In General in its entirety as their last show with the original touring members. What was meant to serve as an awesome send off show for Yuri ended up provoking him to remain with MxPx and it inspired the guys to start working on a new album (Plans Within Plans set for an April 3 release). From there, Both Ends Burning takes turns looking backwards and forwards with incredible concert/rehearsal footage, awesome interviews and some behind the scenes insights about the ups and downs of life on the road. From awesome international trips to stressful vehicle breakdowns, MxPx endures it all with a small. The interviews are pretty great as well, with some really nice things to say from Stephen Egerton (Descendents, All), Ethan Luck (Dingees, OC Supertones, Relient K) and Mike Shea (Alternative Press), as well as members of Flatfoot 56, Simple Plan, Against Me!, A Day To Remember and others. As a diehard MxPx fan since I was thirteen years old (way back in the Pokinatcha days of 1993), my absolute favorite part of Both Ends Burning is Mike's guided tour through The Clubhouse, the old MxPx practice and recording space that's currently serving as their office, merchandise and storage facility. As Mike picks through a storage tub of jaw-dropping early MxPx memorabilia, you can hear the interesting mix of wistfulness and excitement in his voice. While Mike's never been content to just sit back and enjoy what has already happened, there is a lot of merit in taking time to remember what you've done to get where you are. Plus, it's just really cool to see him go through the cassettes, vinyl, VHS, pics, posters and shirts, including the very first shirt they ever made. Whether you're a casual fan, a long-timer or brand new to the MxPx fold, Both Ends Burning is an interesting and fun look at where MxPx has been and where they are headed. Or as the closing scroll of Both Ends Burning so eloquently puts it, "celebrate the past, embrace the future." 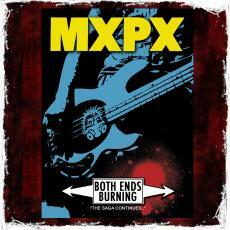 Both Ends Burning can be ordered directly from MxPx HERE.